Yesterday I sliced my big toe down to near the bone--the flesh splayed open, as it will, and I bled a lot. I happened to be on the edge of the Delaware Bay at the time, which happens to have oyster shells honed to razor sharp by the tides coming in, going out. I was looking for a lure I had lost at high tide. I found it. The cost of the subsequent bandages, tape, and (likely) tetanus shot outweighs the cost of the lure, but that was not the point. Jesus had his lambs, I have my lures. The blood poured into the Delaware, now long since consumed by various organisms. Iron, protein, and given my breakfast, maybe even some carbohydrates and lipids for the critters that ate my cells. Communion with transubstantiation pushes human imagination, but the reality makes the myths pale. Blood cells made from plants I ate now feeding creatures I could not begin to describe. Last week Leslie and I wandered along the edge of the same bay after dark, which we like to do, for a variety of reasons. At the edge of the sea, I saw a glow--an eerie bluish glow, about the size of a lemon. I wasn't sure I saw it, because my mind is too rational, or western, or educated to accept things that do not fit in the human symphony. In a moment, the light became obvious--something was lighting the surf like a giant lightning bug. I hope that my blood feeds a creature similar to it, a creature every bit as evolved as you and me, a creature with a common ancestor millions of years ago. There is alive, there is dead, and there is never alive. We belong to the first two categories forever. My cells are now dying faster than they are being replaced. This is not news, but it defies a culture that thrives on linear progress. For all our advances the past 50, 100, 1000 years, we remain human and mortal. I teach biology. I teach sophomores. I may be the last person for the next 4 or 5 decades that tells them that things are mortal, that life works in cycles, that we really don't have a clue about the why's, and we barely grasp the how's. I frightened a child last year when I discussed the Large Hadron Collider, enough that guidance and administration got involved. I mollified the parents, I mollified administration, and I may have even mollified the child, but I am not sure I did. He is extremely bright, brighter than the others give him credit. Part of me hopes that I retreated enough to let him sleep well. Another part hopes he works through the truth far enough to find peace on the other side. I think I am a decent teacher. I will not lie to my students. The two may be related. 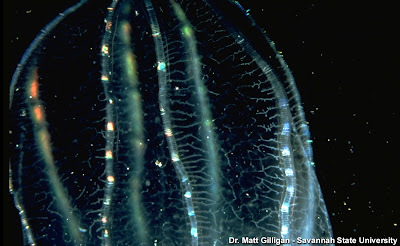 The comb jelly is via NOAA, so I think is fair game--the photographer's name is embedded in the image. What finer place to cut your toe to the bone? You can be sure that not one drop of what you spilt in the sea is lost. In future, you'll look across the Delaware Bay with pride at your contribution! Not as much ouch as you might think--I was more embarrassed than anything else--I was bleeding like a stuck pig, and when I looked at it, realized I had a deep gash and that getting home wasn't going to be easy. Little kids were playing by the edge of the water, I did not want to scare them, so then I did something extraordinarily stupid, I walked on the sand so my blood would not keep dripping all over the place. I am compounding my idiocy by just learning today that C. tetani spores can live in salt water. I am trying to drum up my doc for a tetanus shot, which I should have done Saturday. A fine place, true, but a tad too close to the canal. I'd rather have sliced it on the ocean side of town, but bleeder's can't be choosy.